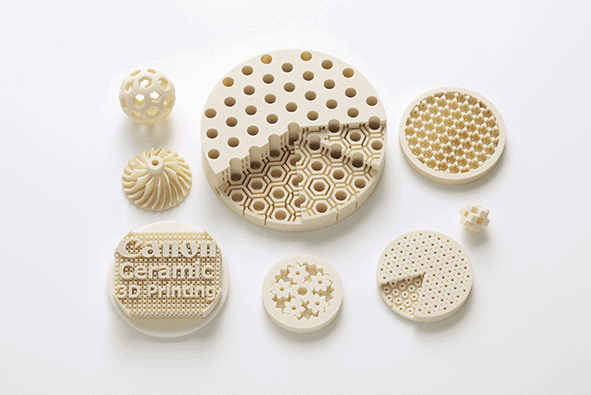 Above: Canon Ceramic parts created using the new SLM technology/Image Credit: Canon Inc.
Canon Inc., the Japanese multinational corporation, announced the development of a new 3D printing technology for printing ceramic parts with complex geometries using a proprietary ceramic material for 3D printers. The process claimed to be ‘highly accurate’ features properties such as high heat and corrosion resistance, high insulating properties and can be utilized in various industrial equipment’s. Ceramic is a great material for its various desirable properties but currently, ceramic 3D printing technology faces many challenges. Currently, parts printed with ceramics can shrink around 20% during the post-annealing process making it difficult for end-use applications. The accuracy and precision are thereby affected and so ceramics are not used on a large scale today. 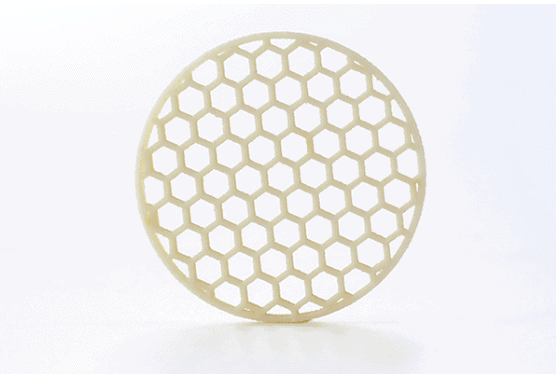 Above: Canon Honeycomb-shaped part/Image Credit: Canon Inc. Addressing this challenge, Canon has now developed a new alumina-based ceramic material which suits Selective Laser Melting (SLM) 3D printing technology. This process will produce much more stable ceramic parts and with complex geometries not possible in existing technologies. Canon showed complex shapes like honeycomb structures, standard impeller, lattice structured hollows, and etc. Parts can be produced with high accuracy with differences in external dimensions before and after the annealing stage of less than 0.8 percent. As yet, Canon has not announced any name for its 3D printing technology and not even disclosed the launch date for the same but it seems the technology is in its final testing phase. Canon Inc. is exploring the possible applications for this new 3D printing technology and their new proprietary materials. According to the team, this technology will be used in all kinds of industrial fields, from parts for equipment that demands heat resistance and insulating properties, such as electric furnaces, to parts facing exposure to chemicals that require corrosion resistance. In the future, Canon also wants to explore the medical application of this technology. About Canon: Canon Inc. is a Japanese multinational corporation specializing in the manufacture of imaging and optical products, including cameras, camcorders, photocopiers, steppers, computer printers, and medical equipment. It is headquartered in Tokyo, Japan.